Periodontal Disease in Cats: February is Dental Health Month! Posted on February 16, 2018 by Dr. Melissa Mustillo. February is dental health month and we like to draw attention to periodontal disease in cats. This is an extremely common condition – did you know that more than 50% of cats over 3 years of age have periodontal disease? Periodontal disease is the accumulation of tartar (plaque) on the tooth surface and inflammation of gum tissue (gingivitis). 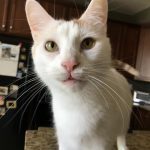 I wanted to share my own personal experience with my cat’s teeth, as well as review some common concerns cat owners share: Is anesthesia safe? How can I keep my cat’s teeth clean at home? A few months ago, I brought my cat Tater Tot to the clinic with me. Tater is only 4 years old, but I was worried about his teeth. I noticed at home that he was suddenly head shy and didn’t like his chin scratches anymore. I performed a full oral exam under anesthesia, and took dental radiographs. Do you know we use the same X-ray that your dentist uses? I found two teeth affected by resorptive lesions, which can be very painful. This condition causes holes in the teeth and is similar to cavities in humans. Ouch! Unfortunately, these holes are in the side of the teeth, and usually can’t be filled like ours can. But at least I was pretty sure I found what was bothering him. I cleaned the tartar off his teeth, and polished them using equipment that is very similar to human dental equipment. The two damaged teeth were extracted, and Tater did great for his procedure and is now pain free! 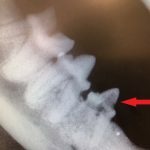 See the radiograph – this is one of Tater’s x-rays and the arrow shows one of the teeth with a hole (black space) in the crown. Many of our clients express concern about dental cleanings for their cat since the procedure requires general anesthesia. 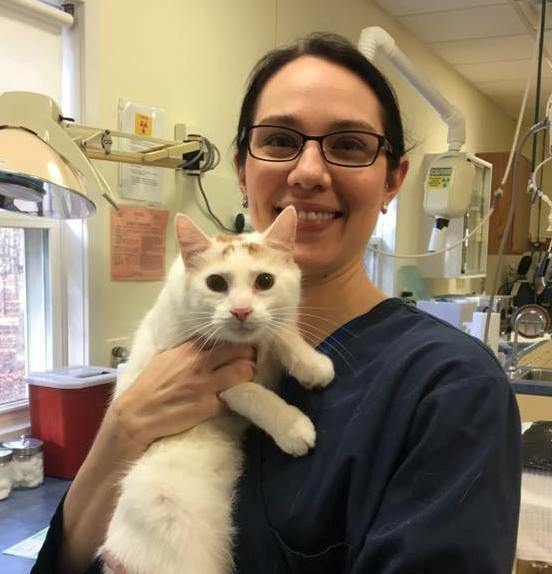 All of our doctors have a healthy respect for anesthesia, and we take many steps to make sure the procedure is as safe as possible for your cat. Pre-anesthetic blood work is performed to check internal health. The morning of the procedure, the doctor performs a complete physical exam to insure your kitty is not showing any signs of a health problem that would increase the risk of anesthesia. An intravenous (IV) catheter is placed in your cat to administer fluids and medication easily. We use state-of-the-art monitoring equipment to closely monitor your cat’s heart rate, blood pressure and breathing. Lastly, the doctor and technician never leave your cat’s side during the procedure, and we closely monitor your kitty after the procedure is over to insure a smooth recovery. What can you do at home to keep your cat’s teeth healthy? Our doctors recommend dental treats such as CET chews, prescription diets such as Hills t/d or Royal Canin Dental, and Greenies treats. The best prevention is brushing your cat’s teeth with enzymatic toothpaste. If possible, start early when your cat is a kitten to get them used to a toothbrush. But even adult cats can be taught to accept tooth brushing. You can even get cat-sized toothbrushes! Check out the video on our website of Dr. Rubenstein brushing her cat’s teeth. To celebrate Dental Health Month and do our part to prevent periodontal disease in cats, we offer a 10% discount off any dental products purchased during February. This includes all our dental diets and treats, as well as toothpaste and toothbrush kits. But anytime is a good time to get your cat’s teeth checked and cleaned if necessary! So we always offer a $50 discount off the price of a dental cleaning when scheduled within 30 days of your cat’s exam. Give us a call to order your dental supplies or schedule your cat’s check up today!